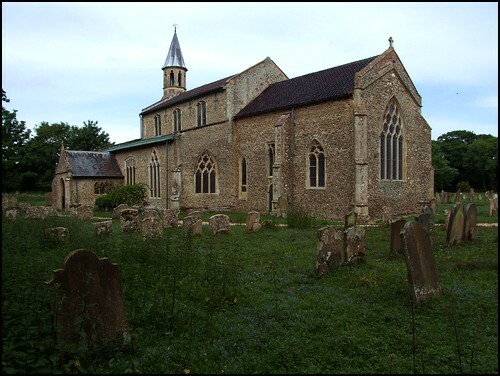 East Anglia has no shortage of big churches, and it has no shortage of remote churches, but it is curious to find such a big church quite so hidden away in the woods and fields. Hockham, more properly Great Hockham, although there is now no lesser equivalent, is a substantial village just off of the Watton to Thetford road, but its great church is about half a mile off, down a long track. Unfortunately, this has given the parish reason to keep it locked, which is most unfortunate, because for one reason at least this is historically one of Norfolk's more important buildings. If you are a James Joyce fan then the name 'Hockham' suggests somewhere fat and comfortable, and that is certainly the impression you get from seeing this church across the park for the first time. It must have been magnificent when it had its tower, but that fell in the early 18th century. The curious turret replacement came in the 1850s, certainly as a response to the medievalist enthusiasms of that time, but in its style pre-ecclesiological. There's a good range of window tracery of all periods, the finest of which is the delicate Decorated tracery of the east windows of the chancel and south aisle, but overall this looks a typical late medieval East Anglian church. The modern parish room built on to the north doorway would be more intrusive on a smaller building, but blends in very nicely here. You step into an interior which belies the setting. This could be a town church, and there was a further restoration in the 1950s which included the replacement of the roof. Hockham's great treasure, however, is from a much earlier time. You turn east to see an extensive scheme of wall paintings above the chancel arch. They are easily discernible, but to really understand them you need to imagine the great medieval rood in front of them: Christ crucified on the cross, and flanked by the Blessed Virgin and St John. 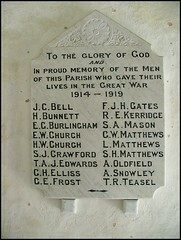 Every single parish church in England had one of these. Not a single one survived the Anglican reformers of the 16th century. The composition above the chancel arch here at Hockham is known as the Exaltation of the Holy Cross. This was a late medieval devotion, and if the assumed date of 1450 for this one is correct, then this is an early example. God the Father is shown seated in Majesty, with the dove of the Holy Spirit descending in front of him. This image would have been behind and above the sculpture of Christ on the cross, the outline of which can be seen, thus completing a Holy Trinity. Either side, and behind where the carved figures of Mary and John would have been, are two kneeling figures, presumably the donors who paid for the work to be carried out, flanked by shields depicting the Holy Trinity and the Passion. Beneath, and the outstanding feature of this survival, St Gabriel appears to the Blessed Virgin Mary at the Annunciation. These last two figures are so clear that you can still make out the words on the scrolls that they bear. Something similar survives a few miles off at Attleborough. In the north aisle are fragments of what is believed to be an earlier extensive scheme of wall painting. The two main scenes depict the Adoration of the Shepherds and the Last Supper, although this latter image has another painting of something visible above. The Last Supper has been obscured by a later monument. The general consensus is that wall paintings such as these were covered up by the Anglicans in the 1540s, but there is an increasing body of evidence that some earlier paintings were obscured up to a century before this, as theological currents were stirred and emphases were changed in response to the Black Death wiping out roughly half of East Anglia's population in the late 1340s. We suddenly all became a lot more serious. At this time, wall paintings change from being broadly devotional to becoming cathechetical tools. Interestingly, the increasing focus on Christ's death on the cross in scenes like this would inform, and crystallise within, the new Protestant theology of the 16th century and after, with its emphasis on Christ dying for the sins of man. Were it not for the wall paintings, there are still important medieval survivals at Hockham. These are the early 16th Century bench ends, which seem to have more in common with contemporary work over the border in neighbouring Suffolk. The best include a Mermaid with a comb and a mirror, a contortionist, and two acrobats. There are similar images a few miles off at Lakenheath. Hockham has late 19th century glass of variable quality. There is a beautiful Adoration of the Magi scene by the Kempe workshop in the east window of the south aisle, and some mildy interesting glass by the minor workshop of ER Suffling in the nave, but the image of Christ as the Good Shepherd is truly horrid. I stepped back out into the bright light of this late spring day. It was the second time I had visited Hockham church, and the previous occasion had been a similarly lovely day. On that occasion, the Historic Churches Bike Ride 2006, we had found St Mary locked, an extraordinary thing for that day in this part of Norfolk, and I had been a little cross, I don't mind admitting. I hadn't been the only one, judging by a furious message which had been scrawled on the checking-in form in the porch. But all was forgiven in the birdsong and sunshine. The graveyard on the south side is secretive and beautiful, not least because all the hideous marble headstones have been banished to the north side. It does worry me to think that, in a thousand years time, when churches like St Mary have crumbled to dust, those awful grey-veined stones with their vacuous messages and kitschy pictures of horses and dogs will still be around, looking just the same as they do today, and our remote ancestors will form all their judgements about us simply by looking at them.